Sure to appeal to any budding Wild Bill or Calamity Jane, Silver Bullet is a fun five reel slot game themed around the excitement and the danger of the Wild West. Featuring a wild symbol, a scatter and a generous paytable, Silver Bullet is a slot which offers great chances for winnings as well as fun and innovative gameplay that’s sure to capture the imagination and get players feeling every inch like a gunslinger. Silver Bullet’s top payline jackpot of a potential £50,000 is far more generous than that found with most other similar slots. A diverse paytable, beneficial scatter symbols and handy wilds combine with that generous jackpot to make for a higher than average theoretical RTP percentage. 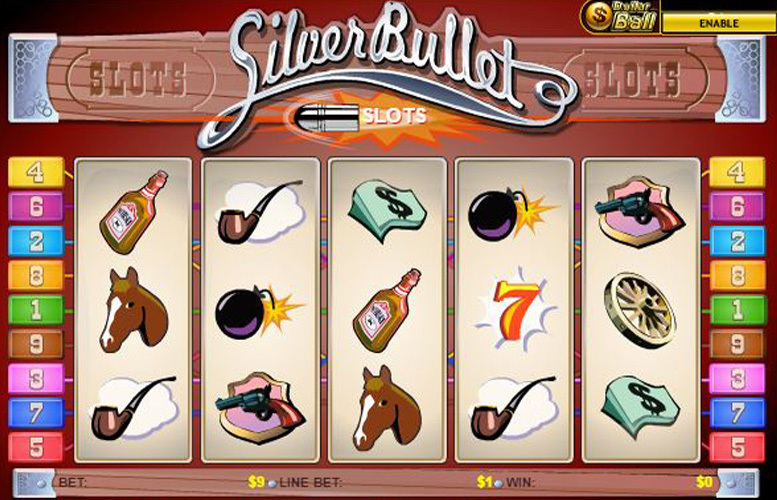 Players can bet as low as 1p per spin, making Silver Bullet great for casual players and low rollers. Lack of a bonus round and quite simple gameplay overall may mean that Silver Bullet is a little simplistic for some players. The inability to alter the number of coins bet per payline means that players have less control over their staking amounts than with some slots. Offering players the chance to visit the Old West, virtually at least, Silver Bullet’s five reels are populated by symbols that will be instantly recognisable to any fans of traditional westerns. Combinations comprising five matching symbols along an active payline are the most beneficial to players, and the most valuable of all is made up of five whiskey barrel symbols. If five of those barrels appear along an active payline, the lucky player will receive a payline jackpot worth 10,000 times their chosen coin value. That means that if they had set the maximum possible £5 coin value, they would be rewarded with a rooting tooting £50,000 top jackpot. Generally speaking quite a simple and a straight forward five reel slot, Silver Bullet does include a handful of additional features to make gameplay a bit more interesting. Those are namely the slot’s wild symbols, scatter symbols and dollar ball feature. Sticking nicely with the Wild West theme, the wild symbol featured in Silver Bullet depicts a sheriff’s badge. When it appears on the reels, the wild can substitute for any other symbol in order to make up the most valuable possible combination and also doubles the winnings returned by any combination it does form a part of. 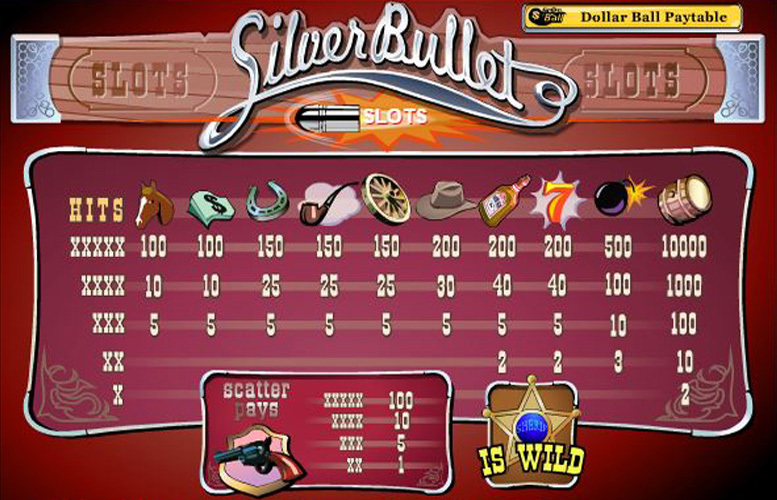 Offering an additional way to win, Silver Bullet’s scatter symbols show off a pistol image and provide payouts if they appear on the reels, even if they’re not in line along a payline. Five of the symbols anywhere on the reels returns a jackpot worth 100 times the player’s total wager, four result in a 10 times payout, three means five times and two delivers a one times payout. A progressive sidegame that runs separately from but parallel with Silver Bullet, the Dollar Ball Feature essentially allows players to take part in a lottery. They must select five numbers from 1-49 and then watch as five numbers are randomly drawn. The more numbers that match theirs, the higher a payout they will receive. As we’ve already mentioned it is the whiskey barrel symbol that is the most valuable and which delivers the highest payout when five align on an active payline. Behind that, however, there are a number of other potentially valuable Wild West themed symbols. The slot’s bomb symbol, for example, can deliver a payout worth 500 times a player’s bet per line which at the highest possible coin value could mean a sizable jackpot of £2,500. As we’ve touched upon previously, Silver Bullet does not give players as much control over their staking as some similar slots. That’s because players cannot alter the number of coins bet per line, which is always set at one. What players can do, however, is to adjust the number of active paylines and the value of the coin bet per line. There can be anywhere from one to nine paylines active at any one time, and a variety of coin values are available between the minimum of 1p and the maximum of £5. Offering as much excitement and drama as a good old fashioned Mexican standoff, Silver Bullet is a slot game that any Western fans are sure to love. The five reel slot delivers outstanding potential jackpots that can reach as high as £50,000 and boasts fun features like wilds, scatters and a dollar ball feature. In spite of those, however, the game is comparatively simple and may become frustratingly repetitive. Silver Bullet, too, doesn’t offer quite as much control over staking as some other slots but the ability to bet just 1p per spin is sure to appeal to those players on a tight budget.